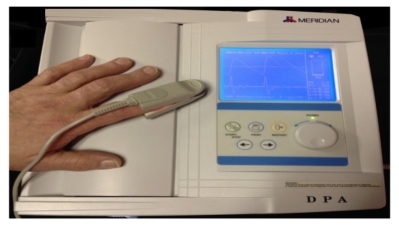 The Digital Pulsewave Analyzer (DPA) is a Health Canada approved device that measures the pulse waveform produced with each heartbeat. Each time the heart beats, it sends a pulse wave down the arteries to your fingers and toes. This wave is then reflected back to the heart and is analyzed by the device. The major cause of cardiovascular disease is the silent and steady build-up of fatty plaque deposits in your arteries. This results in narrowed blood vessels which decrease the blood and oxygen delivered to your heart, brain and limbs. A heart attack or stroke can occur at any time and often without warning.